Charles Darrwin turned the world on its head with his exceedingly insightful realizations. Rather than a mind (of God) creating the organisms of the world, the organisms created the mind that realized how things became what they are. Prior to Darwin (and a few scattered predecessors who just guessed or didn't really develop the theory), it was only natural, or even sane, to assume some kind of creation was responsible for the highly organized state of living nature--the structures and diversity of species. Creationism in its various forms was at best a minimalist kind of explanation, with essentially no empirical content other than to recognize the existence of complex organisms. Darwin showed two fundamental things. First, his jaw-dropping ability to synthesize countless diverse facts led to the conclusion that life was an historical phenomenon of descent with modification (his phrase) from common origin of one or a few forms; he allowed for the latter and in revision and perhaps under pressure to soften his statement, invoked a semi-religious explanation ("having been originally breathed by the Creator into a few forms or into one"). So far so good. The evidence for common ancestry was overwhelming once you thought about it. 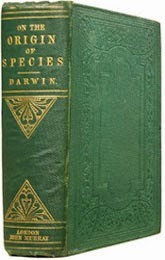 Prior explanations about the gradual diversity of organisms, what was called the 'Great Chain of Being', were generally theologically derived and were consistent up to a point, but once geology, geography, and many other facts were assembled by Darwin (and to a certain extent, Alfred Wallace), Darwin's idea was much more suited to Enlightenment science's worldview. But this is a generic descriptive explanation--descent from common ancestor--and the obvious next question was how could complex structures arise? The revolutionary idea was that complex functional structures, too, were the result of the process of descent with modification--the idea was the gradual modification of traits, slowly screened by a competitive environment so that only the best could reproduce. This was life as a cruel phenomenon but one that could mold traits by the raw rule of relative survival. Darwin called this 'natural selection'. He was in fact worried that the word 'selection' might be seen as implying God as the selector, but his writing was clear enough that that wasn't his idea. Still, he adopted Herbert Spencer's more draconian phrase 'survival of the fittest' as more directly expressing what he was thinking. Darwin was a product of the Newtonian era of triumphal science that was part of the Enlightenment period in European intellectual history. To Darwin, natural selection was a force, just like gravity, and he was repeatedly very clear about this idea. As a force, selection could 'see' (detect and respond to) the tiniest differences in the suitability of individuals to their circumstances, and sieve their survival or reproduction accordingly. A force like that seemed fine, in principle, and was part of the mode of thinking at the time. Of course, since evolution was slow, it could be--and was--debated whether selection was the true explanation for the diversity of species in the plant and animal world. It was easy to see Nature's cruelty but that didn't prove selection as a systematic force. But there was a more serious epistemological problem with the idea. Selection is just a hair-breadth away from being a tautology, because in a way it can be re-phrased as 'survival of the survivors', and that doesn't explain anything at all! This issues has been debated by philosophers and biologists ad nauseum, and we needn't debate it here, but we do need to note that to make selection a scientific 'force' of nature, we must show that differential survival is because of or due to, heritable traits in competing organisms. It's easy enough to show how gravity works as a force, but much harder to show that selection does. After all, whoever survives did in fact survive and it's not always (indeed, rarely is) clear why or that the reproductive success was due to more than just plain good luck. In fact, if selection is Newtonian there can be no luck involved, even in principle! Since pretty much every biologist acknowledges that luck--chance, or probability--has at least some role in the lives of organisms, the problem is not a trivial one. Darwin had only a rudimentary sense of probability in this context, though he did acknowledge that he stressed selection specifically because it showed no need for theological or non-material explanations. However, this is all very well known. Even if chance plays some role, we do indeed need to have a mechanistic explanation for the origin of complex traits in organisms, like the fingers I'm using to type this message, the eyes that watch what I'm doing, and the brain that (hopefully) introduces some sense into it. Natural selection has become entrenched essentially as dogma, applied to everything and uncritically when cogent specific explanations aren't supported by much more than the author's say-so. That's why adaptation 'explanations' are widely known as Just-So stories, because they, too, verge on tautology--they're plausible and could be true and are appealing and can't be refuted so they're assumed to be true as actual explanations. Most biologists, and especially others such as anthropologists and even the preponderance of the biomedical research community, not to mention the popular science press, seem to cling to natural selection as the one and only explanation, and of course as the first, middle, and last defense against creationist explanations. But that's wrong. It is in this sense that the deep insight of an explanation for organized traits becomes mythology. What seems to be far less known and even farther less acknowledged is that there are a diversity of other ways, other wholly material means, by which complex traits can arise than by natural selection. In this series, we'll explore them, beginning next time with natural selection itself. Someone tweeted a question as to where Darwin showed that he was a Newtonian thinker, with natural selection treated as similar to the law of gravity. I'm too verbose to reply in 140 characters, so here are my thoughts, briefly. Such thinking is very clear in much of the Origin, and in CD's letters and his draft chapter and letter to Asa Gray that were read to the Linnaean Society in 1858. I have written about this in many places, but of course that is just my opinion from reading his work, not as a professional historian or philosopher. Darwin wrote voluminously, knew how to cover his bets, revised his book to respond to criticism, and one can probably find whatever one may seek somewhere or other. However, I think it is not imaginary exegesis on my part to say that he was part of his Enlightenment-driven time, with a Newtonian view of 'laws' of nature. As to likening selection to gravity, this is done at least implicitly in his famous concluding paragraph in the Origin.